The varied fleet of aircraft operated by Classic Air Force (formerly the Air Atlantique Classic Flight) are much loved on the UK aviation scene, so when the organisation announced it was to relocate to Newquay in 2013, the decision was the hot topic of conversation on our forums. However after only two years the new museum at Newquay closed, raising questions regarding the fate of the aircraft located there. 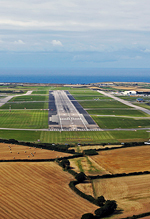 Now, six months on from the official closure of CAF Newquay, we visited Newquay Cornwall Airport to see the new 'Cornwall Aviation Heritage Centre' and find out if this new venture can succeed as an aviation attraction in Cornwall, where several others have failed before? Peter Reoch spoke to Geoff Ogden, one of the driving forces behind the new museum. Much was said online about the seemingly sudden closure of Classic Air Force Newquay, with criticism directed towards the management of the charity and parent organisation Air Atlantique for the lack of communication with its supporters and members. We asked Geoff about the closure and how the new Cornwall Aviation Heritage Centre came about. "The closure of Classic Air Force Newquay was certainly a huge disappointment for all the dedicated volunteers and staff, but also for the people of Cornwall who lost an interesting attraction and brilliant facility. However through nobodies fault, various factors transpired against the museum which meant CAF returned to their original base at Coventry Airport. 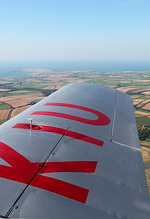 Fortunately, the dedicated team of volunteers here have been able to set up a new attraction at Newquay Cornwall Airport, securing the future for a number of iconic British aircraft types. We have worked hard to create something which should be affordable for the longevity and something that will be really positive for Cornwall." The area that will be occupied by the new Cornwall Aviation Heritage Centre is part of the Newquay Cornwall Airport "Aerohub" investment area, within the Hardened Aircraft Shelter (HAS) site which was of course formerly part of RAF St Mawgan. The Aerohub is growing dramatically and the new museum is surrounded by facilities being used by companies such as GateGuards UK Ltd, Apple Aviation & Bloodhound who will use the airport's 9000ft runway to trial their supersonic car prior to its land speed record attempt next year. We asked how the Heritage Centre would operate and what plans they had for their HAS. 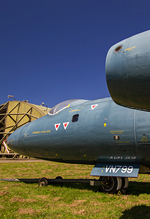 "The fact the museum is within a genuine Cold War Hardened Aircraft Shelter gives us a unique atmosphere which we hope our visitors will recognise and enjoy. The operation of the Cornwall Aviation Heritage Centre is focussed around the great team of volunteers we already have, with a small number of paid staff too. As more money comes in we plan to employ more paid staff as we see this as an employment opportunity for the people of Newquay, especially by creating skilled work within Cornwall's growing aviation industry. Within the HAS, our Harrier GR3 and Hunter T8M will be on display inside, along with an extensive model and archive collection, indoor children's play area and a number of aircraft engines. The aim is to make the area exciting and engaging for all ages; hence why we are keen to have our aircraft open for the public to access." On the topic of the aircraft themselves, it must be said the new museum does have a very interesting mix for visitors to admire. Ownership of the static airframes that were previously on display at CAF Newquay has been transferred to the Cornwall Aviation Heritage Centre and these aircraft will be joined by a couple of new aircraft being loaned to the museum including a rare example of the Colomban Cri-Cri (the world's smallest twin-engined aircraft) and also a gyrocopter. Many of the airframes have undergone restoration and repainting programmes over the last couple of years including the Vickers Varsity which was formerly on display at IWM Duxford. The aircraft is painted in the traditional RAF Training Command silver and yellow paint scheme and the interior of the aircraft has been painstakingly restored to its original condition. Letting members of the public enjoy the aircraft up close and personal will be a key theme of the Heritage Centre, as Geoff explained. "The difference between Cornwall Aviation Heritage Centre and many other aircraft museums is that our aircraft will not be exhibits which must be viewed from behind barriers. It's all about getting 'hands on' and giving our visitors an experience they'll remember. Sitting in the cockpit of a Hawker Hunter or on the flightdeck of a VC10, climbing inside the Varsity and experiencing the smells and feels of vintage aviation." The collection's two largest aircraft can be seen for miles around the airport, with the iconic T-Tails of the Vickers VC10 and BAC 1-11 piercing the skyline. The fate of ZA148 in Cornwall has been the subject of many rumours and discussions over the past 12 months, after it was previously announced that Classic Air Force had planned to convert the aircraft into a restaurant, in a similar fashion to the highly successful DC-6 Diner at Coventry Airport. We asked what was planned for the VC10 & BAC 1-11 at the Cornwall Aviation Heritage Centre. "Although I cannot comment on what Classic Air Force may have planned to do with the airframe previously, our plan for ZA148 is that in very near future the aircraft will be refitted with its Rolls-Royce Conway engines and the aircraft will be maintained to a high standard thanks to great support from GJD Services. With only 54 aircraft built and only a handful of examples preserved, we recognise we have an important role to preserve such an iconic machine. We will continue to run tours of the interior & exterior of the aircraft which were extremely popular at the previous museum, showcasing the role this K3 airframe played as an air-to-air tanker with a range of interesting documents and photographs on display inside the aircraft. 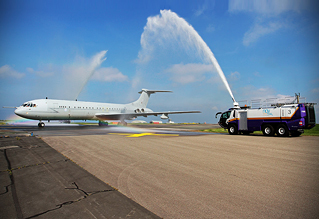 Likewise we will continue to maintain the BAC 1-11 as a live aircraft, with periodic engine runs for the public to enjoy. We also have plans to turn the cabin of the airliner into a classroom as part of our education programme but this will not distract from the preservation of this unique airframe." It is certainly encouraging to hear that the future of these two rare airliners looks promising, and that the BAC 1-11 - which was of course formerly a trials aircraft for QinetiQ - will be used to educate and hopefully inspire future generations of aviation professionals. Although it is early days, we asked if any other training programmes were planned for the venture in line with other aviation museums such as IWM Duxford or the RAF Museum. "We recognise that education is vital, it's a major part of why we preserve these historic aircraft and having a dedicated educational programme is a huge part of any museum. We have already drafted our own education strategy and our local secondary school will be running a pilot scheme with us from September with the hope of creating a number of aviation and engineering related courses for students. We will also offer volunteer schemes, compatible with qualifications such as the Duke of Edinburgh award. Of course, the site will be available for day trips and we will work hard to accommodate any other facility a school would like to utilise. As mentioned before; although the BAC 1-11 will be a running aircraft, the cabin interior will be modified to be used as a classroom and we are currently taking advice from local schools regarding the best possible layout of the interior so they can deliver unique lessons inside the airliner." Along with the aircraft currently on display, there are also others awaiting their turn to be restored to their former glory and then placed on display in the future. At the time of our visit, both the Sea Hawk & Lightning were outside looking slightly worse for wear so we asked for an update on the restoration process. "Both restorations have fallen to the bottom of the job list due to the move across the airfield, but as soon as we're up and running we will have our volunteer team working hard to restore the aircraft to the same high standards achieved with our other aircraft. Once assembled and restored to display standard the Sea Hawk will likely be painted in the traditional Royal Navy grey and white colour scheme, but this is yet to be officially decided. The English Electric Lightning will be painted in a silver paint scheme (squadron markings to be decided). This decision is based on preservation as the silver paint used is a very hard wearing paint which will help ensure the longevity of the aircraft, and we'd like to thank AkzoNobel for their continued support with helping us to restore the collection of static aircraft." It is positive to hear that the impressive collection will be expanding in the coming years, and that airframes on display will all be receiving some love and attention when their time comes. However how safe is their future given the failure of the previous museum which had significant financial backing? Obviously the key issue with Classic Air Force Newquay was the lack of visitors through the door, however the team at Newquay are confident that their new venture will be able to survive using a modest budget and better marketing. "The team that are looking after our marketing and commercial interests are all local people, who have all worked within the Cornish tourism industry for many years so we feel we have a good footing with which to work our local economy. Cornwall welcomes 4.5 million visitors each year and we have a strategy which involves targeting the hotels, campsites, coach companies and tourist information centres to make sure everyone knows that there's a brand new facility for them to visit and enjoy. The museum can be a great wet weather attraction but also an alternative to the beach on a hot and sunny day." Looking at the new site, it certainly has the potential to be something very special. Geoff showed us around the area, detailing how the aircraft will be arranged, the layout of the new café which will have a 1950s retro theme, and the clear spaces that will be available for commercial hire for local companies to exhibit. The team are also hoping to hold a number of special events during peak seasons as was operated to great effect at CAF Newquay. 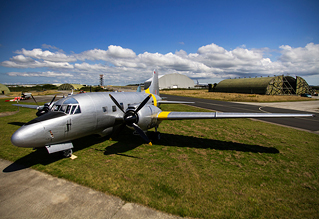 With airside access also available, the museum is currently in discussions with locally based 'FlyNQY' to offer trial flying lessons in their resident PA-28 Warrior aircraft from the site, as well as warbird experience flights in both Chipmunks & Harvards coming from nearby airfields during the summer season. Indeed as we toured the site, there was a very positive attitude from all the volunteers present that the attraction can and will succeed. Alongside the excellent collection of aircraft on display at the Cornwall Aviation Heritage Park, Newquay Cornwall Airport is certainly a busy and interesting location for aviation enthusiasts to visit. Although commercial traffic is fairly limited, during the summer it attracts a number of interesting general aviation movements and is frequented by visiting Royal Air Force & Royal Navy aircraft on an almost daily basis. AgustaWestland's Operational Flight Training Centre is located at the airport, which generates visits from AW101 & Lynx helicopters in varying colour schemes. 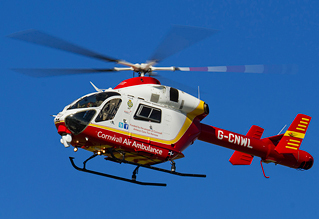 Later this year Bristow's new SAR-H base will open, with two Sikorsky S-92 helicopters being based for Search and Rescue duties. The location of the new museum may not be as ideal for photography as the previously facility at Hangar 404, however it will still provide a good location to overview flying activity at the airfield. We'd like to thank Geoff Ogden for his time and wish all the volunteers at the Cornwall Aviation Heritage Centre the best of luck for the venture's opening later this year. We certainly hope the new venture is a success and generates enough revenue to remain financially viable for many years to come to guarantee a safe future for all aircraft now resident. For all the latest news from Newquay check out their facebook page.